Sealaska Heritage Institute (SHI) is bringing two master artists to Juneau to teach Northwest Coast art to inmates at Juneau’s prison and half-way house. One of them will also teach a free language class. 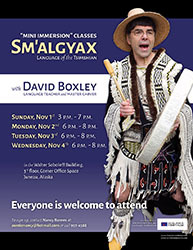 Washington-based Tsimshian master artist David A. Boxley will teach formline design at Gastineau Human Services and Sm’algyax (Tsimshian) mini-immersion classes at the Walter Soboleff Building. Haines-based Tlingit master artist Wayne Price will teach carving to inmates at Lemon Creek Correctional Facility. A masterpiece by Boxley was unveiled during the grand opening of the Walter Soboleff Building in May. The main entry features his piece "Am'ala: Wil Mangaa da Ha'lidzogat" (The Man Who Held Up The Earth), which is thought to be the largest carved-and-painted Tsimshian house front in the world. Several Northwest Coast art scholars have noted the house front will become the masterpiece for which Boxley will be known. Price took Best of Show at SHI’s 2014 Juried Art Show and Competition for his carved Dancing Raven Hat, and he swept the competition’s formline category, taking home all prizes. The new Walter Soboleff Building features cedar throughout that was hand-adzed by Price. SHI is co-sponsoring the evening language classes, which were organized by Nancy Barnes. Haayk Foundation also is a sponsor. The classes at Lemon Creek Correctional Center are scheduled Nov. 2-6. The classes as Gastineau Human Services are scheduled Nov. 2 and Nov. 4-6. The Tsmishian classes in the 3rd floor corner office in the Walter Soboleff Building are scheduled 3pm-7pm, Sunday, Nov. 1 and 6pm-8pm Monday-Wednesday, Nov. 2-4 and are open to all aspiring language students. Sealaska Heritage Institute is a private, nonprofit founded in 1980 to promote cultural diversity and cross-cultural understanding. The institute is governed by a Board of Trustees and guided by a Council of Traditional Scholars. Its mission is to perpetuate and enhance Tlingit, Haida, and Tsimshian cultures of Southeast Alaska.